The fourth round of the Formula Renault 3.5 Series in Budapest produced a fourth place finish for Jazeman Jaafar in the second race of the weekend, following disappointment in the first race when a puncture in the opening lap put the Malaysian driver out of contention for a points finish. 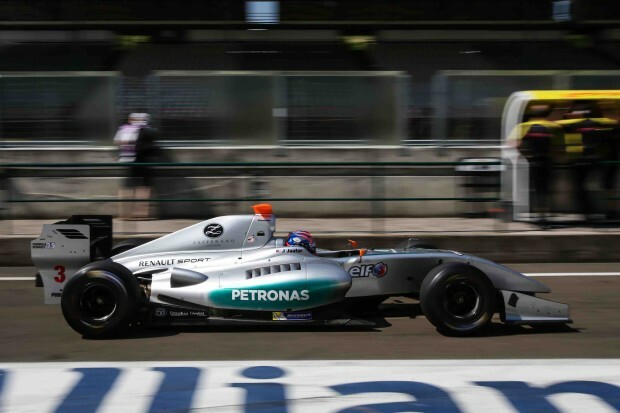 The PETRONAS Talent Development Programme driver lies third in the championship with five rounds remaining. Jazeman’s weekend didn’t get off to the best of starts, after gearbox and clutch problems sidelined him before he had completed a lap of the Hungaroring circuit. Despite this lack of running before the first qualifying session Jazeman put in a quality performance to post fourth quickest lap for a second row grid start in the first race. The Saturday morning race saw a fraught and frantic run down to the first corner when the green flag flew. Jazeman was uncharacteristically slow off the line dropping him into the clutches of the chasing pack and with the close fighting Jazeman was hit by a rival and from this suffered a puncture forcing him to pit for a new tyre. He returned to the track, but was well down the order and unable to make up ground over the remaining laps. Jazeman produced another strong effort in Sunday morning qualifying for the second race and third fastest lap for another second row start to the afternoon’s race. Lining up on the grid Jazeman struggled for traction off the line and dropped down the order. However, a smart strategy by the Fortec Motorsport team brought Jazeman into the pits for an early mandatory tyre-change stop. Running in clean air on his return to the track, a series of blistering laps from the talented 22-year-old improved his position and after all the cars had made their stops Jazeman was lying in fourth place. With second fastest lap of the race Jazeman crossed the finish line in fourth position to collect valuable points and keep himself in the hunt for championship honours, lying third as the Series nears the midway point. The Formula Renault 3.5 Series fifth round takes place at Red Bull Ring in Austria from 11-12th July.